Just Like and Share our photo on Facebook! Click on photo to visit our Facebook. Competition ended – Winner Catherina Redmond, congrats! 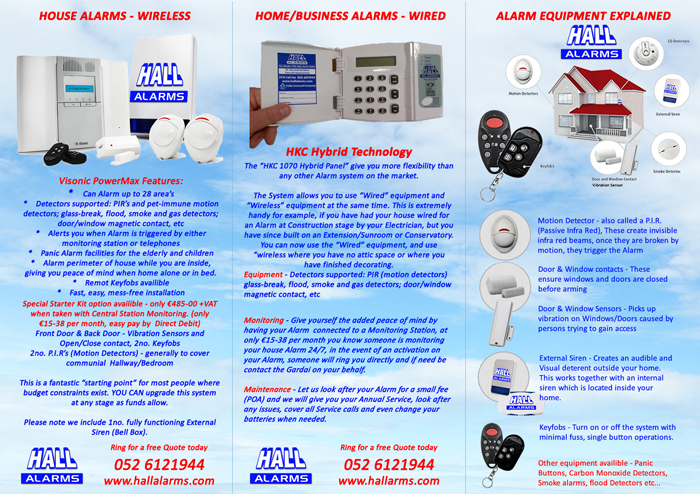 2012 is a year of celebration for Hall Alarms Ltd as it celebrates over 30 years in business. “Watch Out” for our 30th Anniversary promotions coming soon. Keep up to date on Facebook, Twitter or our website. Can you remember 30 years ago? Issued by the Private Security Authority. For further information contact the Authority’s Communications Unit at info@psa.gov.ie. PJ Shanahan President of Thurles Chamber is delighted to announce that the proposed closed circuit television (CCTV) system for Thurles has been given the green light by An Pobal and the installation of the cameras and system can begin immediately. It is hoped that the system will be fully operational by 2012. 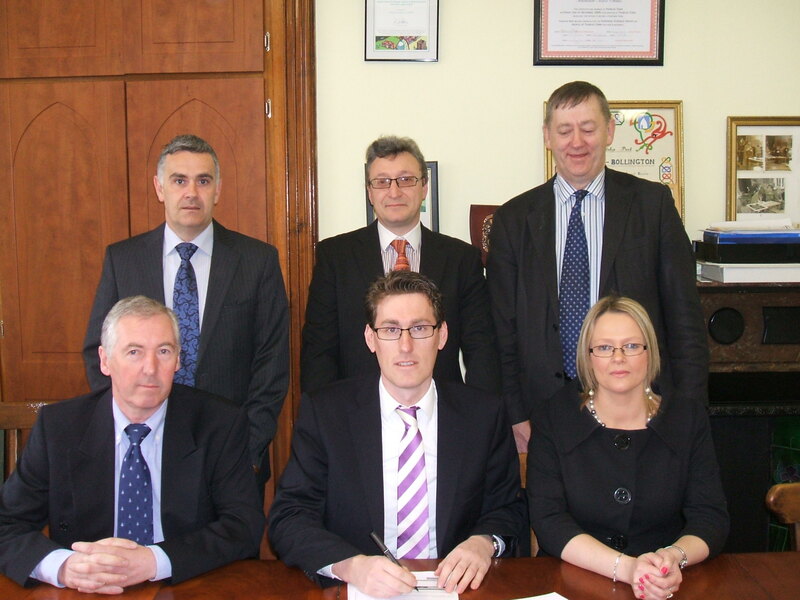 The funding for the project will be financed by An Pobal 70%, Thurles Chamber 15% and Thurles Town Council 15%. The entire system will be designed, installed and maintained by three Tipperary companies, Hall Alarms based in Clonmel, Future Security in Nenagh and Amarach Technologies, also based in Nenagh. As PJ says “We’re delighted that we can support three local businesses and it shows the quality of Tipperary technology companies that three Tipperary businesses won the tender.” The winning tender was spear headed by Eleanor Lahart of Hall Alarms. Dermot Benn of RMI a professional in the CCTV sector helped the CCTV committee pick the winning tender. 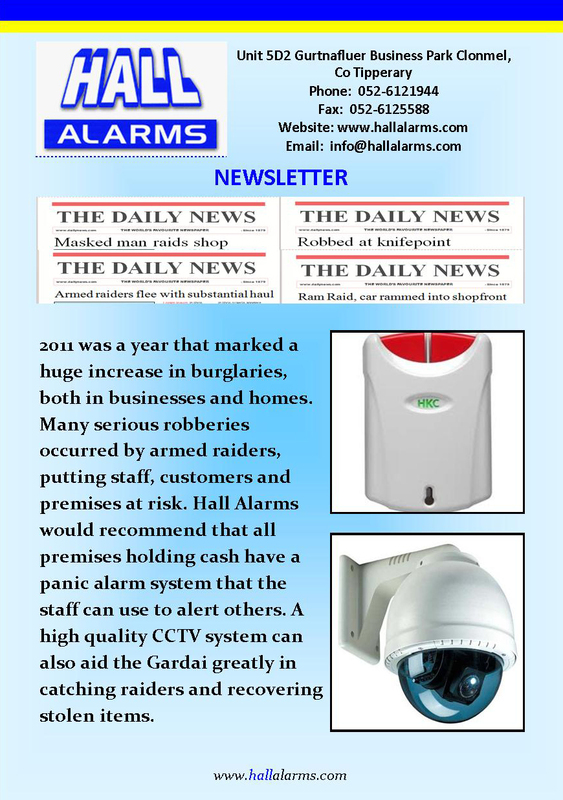 Eleanor Lahart, Chief Executive of Hall Alarms says “This is a substantial award for Hall Alarms, it shows that local companies who invest in expertise, quality equipment and provide value for money, can compete against national companies who would normally be awarded these tenders”. The system includes 10 Pan, Tilt and Zoom cameras, with the capability to cover large areas and the facility to zoom in for finer detail. The system is based on advanced wireless technology, with it’s own private secure network, this protects the integrity of the system as well as future proofing it. It will be one of the countries most advanced, state of the art Town CCTV systems. The entire system will be designed, installed and maintained by three Tipperary companies, Hall Alarms based in Clonmel, Future Security in Nenagh and Sentry Digital Solutions, also based in Nenagh. The installation will take approximately three months. The project, which has taken over five years of hard work to deliver, was a Thurles Chamber initiative that would never have been possible without the help of the Town Clerk Michael Ryan, Sgt Sean Sherlock and Superintendent Pat Lordan. “The entire Thurles Chamber have been behind this initiative but a number of members which should get special mention are Paddy Barry, Noreen Foran, Pat Donnelly, Diarmuid Moran and Pat Hayes who were all involved at different stages of getting the project off the ground and keeping it alive – without their continuous support and enthusiasm for this project, it would never have got to this stage. A huge thanks also goes to Michael Ryan, Cllr Seamus Hanafin, Superintendent Pat Lordan and Sgt Sean Sherlock – their help was invaluable and forthcoming at all times.” PJ Shanahan told the Tipperary Star this week. CCTV systems are most commonly used to tackle anti-social and criminal behavior, through either detection and investigation of crime and/or through crime prevention. Ireland is a relatively late adopter of public- space CCTV compared with other European countries, The first experiments with town centre surveillance started with Templebar, Dublin in 1995, followed by installations in O’Connell Street, Dublin, Tralee, Cork, Bray, Dún Laoghaire, Dundalk, Limerick and Galway. Then, from 2007, a new model was adopted; taking advantage of advances in digital recording, wireless transmission and camera designs. The report finds that Recorded Burglaries, Fraud & Kidnappings have risen but on the plus side, falls are seen in most other groups. Burglary and related offences rose by 10.3% compared to the corresponding period ending in June 2011, while Fraud, deception and related offences rose by 8.0%, Kidnapping and related offences rose by 7.8%. 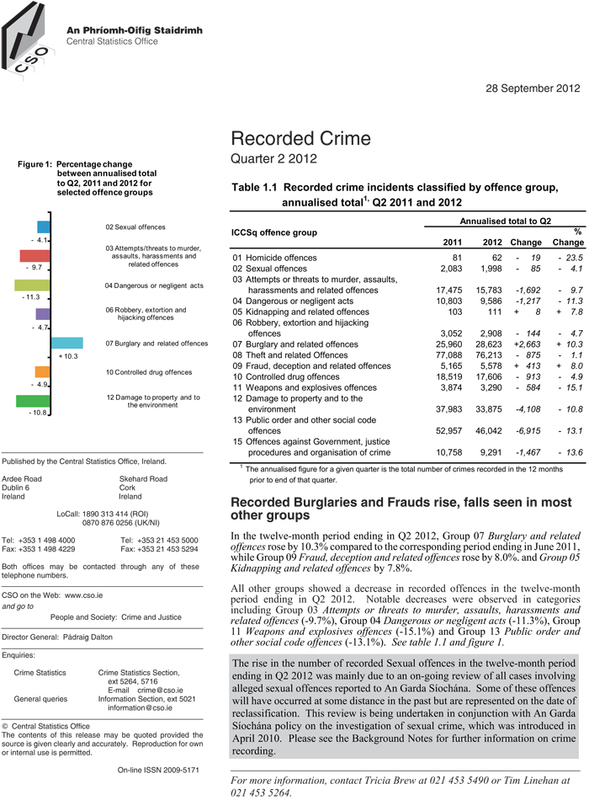 All other groups showed a decrease in recorded offences in the twelve-month period ending in Q2 2012. Notable decreases were observed in categories including Attempts or threats to murder, assaults, harassments and related offences (-9.7%), Dangerous or negligent acts (-11.3%), Weapons and explosives offences (-15.1%) and Public order and other social code offences (-13.1%). 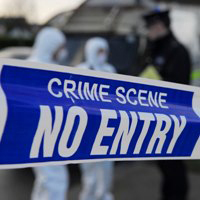 In the twelve-month period ending in June 2012, there were 28,623 recorded Burglary and related offences representing an increase of 2,663 (+10.3%) on the corresponding period ending in June 2011. Comparing the same periods, Aggravated burglary fell by 19.4% while recorded Burglary (not aggravated) offences increased by 10.3% to 27,619. Recorded Theft from person offences increased by 43.1% to 4,284 in the twelve-month period ending in Q2 2012, while Other thefts, handling stolen property offences rose slightly (+0.2%) to 42,972. Recorded Theft/Taking of vehicle and related offences fell by 20.2% in the same period to 8,982. There were 9,291 Offences against Government, justice procedures and organisation of crime recorded in the twelve-month period ending in Q2 2012, a decrease of 13.6% when compared with the corresponding 2011 period. (Needless to say these figures were compiled before the events which have taken place in the last week). Please click here to view an executive overview of the report. 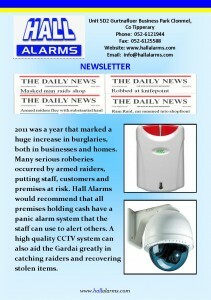 2011 was a year that marked a huge increase in burglaries, both in businesses and homes. Many serious robberies occurred by armed raiders, putting staff, customers and premises at risk. 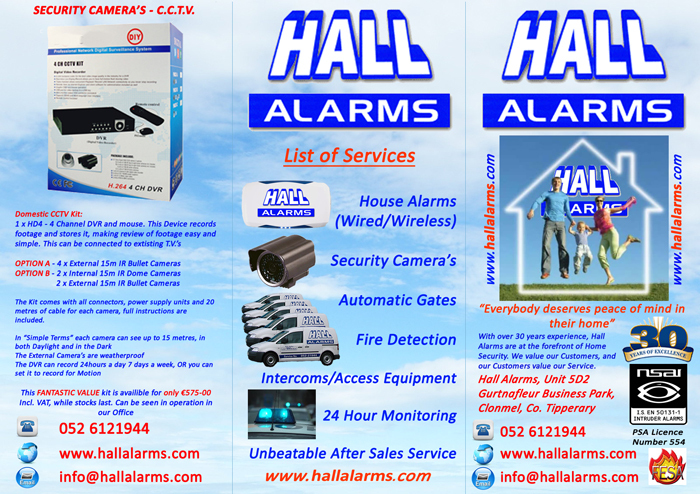 Hall Alarms would recommend that all premises holding cash have a panic alarm system that the staff can use to alert others. A high quality CCTV system can also aid the Gardai greatly in catching raiders and recovering stolen items. 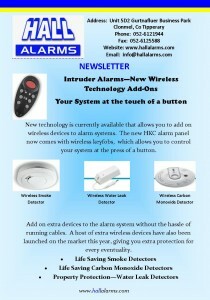 New technology is currently available that allows you to add on wireless devices to alarm systems. 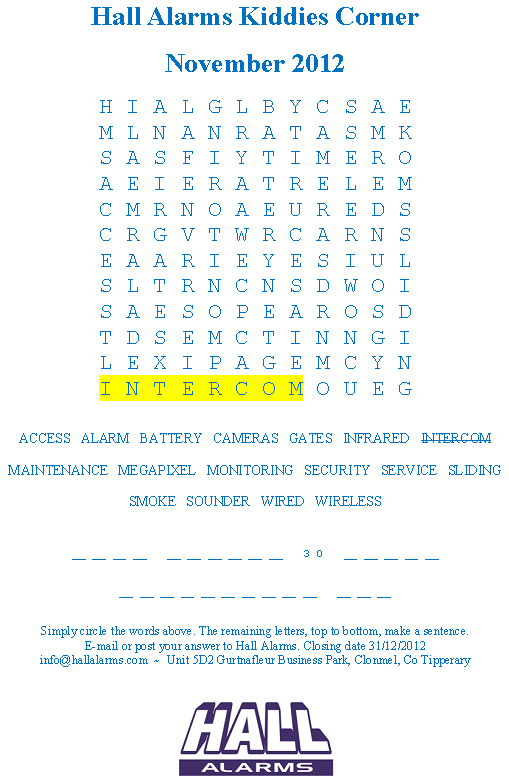 The new HKC alarm panel now comes with wireless keyfobs, which allows you to control your system at the press of a button. 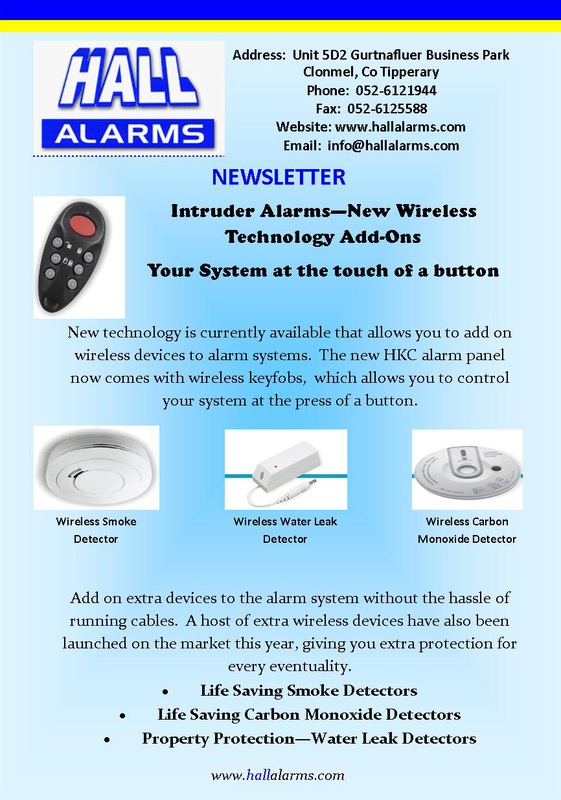 Add on extra devices to the alarm system without the hassle of running cables. A host of extra wireless devices have also been launched on the market this year, giving you extra protection for every eventuality.